Wins of Fortune Slot is powered by the skilful game provider – Quick Spin. It did not skimp on the means to create a spellbinding slot machine scattered with some awesome symbols. On this 5reels and 76 to 259 ways to win, you will discover the legendary hero who guards the slot! Create an account on Wicked Jackpot to log in anytime you want to spin the magnificent reels of Wins of Fortune Slot. 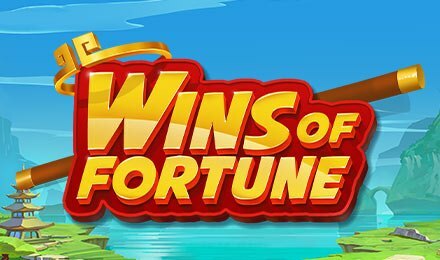 As soon as you kick-start your spinning adventure on Wins of Fortune Slot, you will find a cascade of symbols such as five different coloured gemstones, you will find four mythical characters and it includes Zhu Bajie and Sun Wukong. These symbols will swirl with every spin of the reels! Ready to enjoy the show? Bet Levels: On Wins of Fortune Slot, there are no Bet Levels! Amount of Paylines Selection: You will find the 76 to 259 ways to win that will remain active during your spinning sessions. Coin Values: No coin values but you can choose from a wide range of Bet Values: £0.20, £0.40, £0.60, £1.00, £2.00, £4.00, £6.00, £10.00, £20.00, £40.00, £60.00 and £100.00. The wild symbol on Wins of Fortune Slot is the icon with the word WILD that is written on it. The Wins of Fortune Respin Feature is launched with any win on Wins of Fortune Slot. Then, the winning symbols along the reels will move a step to the left just as the grid of this game evolves. The remaining symbols will remain for a re-spin. Now, your wins on this Quick Spin game will be paid for every respin and this will continue as long as there is no more win. When the Super Respin Feature is launched, the sky will change into a red colour. And it all starts as soon as the game reaches a full 5x5 grid. Each of the winning icons will stay plus the game will respin as long as you will find no extra symbols on the grid of the slot.